How Can I Observe the Sabbath Without a Congregation? I hear this question a lot. In fact, I used to ask this question a lot. You may feel the pull of the Holy Spirit to observe the Sabbath. You may find that your heart and perspective toward the scriptures, the Israelites of old and the land of Israel today is different than those you currently worship with at church on Sunday. But now what? You don’t know anyone else who is pursuing these things; there’s no gathering on the Sabbath that you can be part of. How can you keep the Sabbath on your own? What should you be doing? What about the command of assembling with others on the Sabbath? The first thing to do is hold on to that inclination. Don’t discard what you’re hearing, because you don’t have a congregation, don’t know how to do it or don’t have anyone else to do it with. You can do this with just you and Yeshua. In fact, this could be some of the sweetest times you have with him, just being alone together, following only your heart and his voice for how to worship him on the Sabbath. If Yehovah is leading you to keep the Sabbath on your own, then he’s got a good reason. While it was awhile before I could fully observe the Sabbath every week, I studied Messianic perspectives on my own for two years before Yehovah raised up a congregation in my area. I prayed and prayed for Yehovah to lead me to others pursuing the same interests, but in hindsight I can see why I needed to be on my own for a time. It was so that I could hear directly from Yehovah and know that it was his leading. I could not point to a teacher or leader or even a friend that had influenced me to pursue this path. I knew beyond a doubt that this was Yehovah’s leading alone. It forced me to seek him only for my questions and understanding. I needed this time with just Yehovah to plant my feet firmly for when opposition came, and to also be able to recognize who to “congregate with” when the time came. If Yehovah is leading you to keep the Sabbath, you can do this. He will provide guidance and a way for you to do what he’s asking. There are commands for how to observe the Sabbath, but there are also many things man has created to honor this special day. I’ll distinguish between those here. I encourage you to keep as many of the Bible’s commands as you can, but then be free to find your own “tradition”, things meaningful to you that you can weave into your day. While other instructions for keeping the Sabbath can be inferred from scripture, these are the most straightforward and foundational components. and to feast on the inheritance of your father Jacob. He desires to be with you without all the distractions. He desires for you to find the joy and strength in him that can only be found when you begin setting aside the Sabbath for him. Lion & Lamb Erev Sabbath Service – A Messianic service including worship and teaching, recorded each week live, then available on demand until the following Sabbath. Hebraic Roots Network Programming – A constant stream of Messianic teaching from reputable teachers, check the program guide to plan your time. With the various distractions and tangents available on the Internet, I would caution you to limit your time and to stay on the sites you planned to visit. While there are a myriad of Godly and useful ministries, this is your day to focus on only what Yehovah has for you. If there’s a Bible study available in your community on Saturdays, that may be a good option for you. I don’t recommend abandoning your Christian gatherings altogether at first. Assembling with other believers is a key part of growing in our walk with Yeshua. In my case, I found others in my Sunday church congregation who were studying Messianic perspectives, and eventually a small group of us began meeting on the Sabbath. That group has now grown into the congregation I was praying for. Once you put aside your own projects and pursuits, there are so many ways to be with Yehovah and enjoy his special day: Study, worship, reading his word, praying – and don’t forget actually resting, doing nothing is okay on this day. I find that it’s sometimes easier to do if I get out of the house, physically away from the distractions. Walking, driving to a beautiful scene, sitting in a peaceful or joyful place can be wonderful ways to be with Yehovah. Here are some resources I recommend to enhance Messianic study and Bible reading. While not commanded in the Bible, many traditional customs for observing the Sabbath can also enhance your experience. As we said earlier, setting apart the Sabbath from the rest of your week is commanded in several places in scripture. However, there are no specific instructions for doing so. It is customary to mark the beginning and end of the Sabbath with a bit of ceremony that encapsulates the spirit of the Sabbath. These rich traditions have been passed down through the centuries and, in some cases, slightly modified for Messianic believers. Based on Genesis 1 and other scriptures, the Sabbath begins and ends at sunset. Here is a guide to the time of sunset in your local time zone. This can be an easy way to include others in your Sabbath observance, even if they don’t typically observe it. A simple meal made in a slow cooker or bought before sundown is a good way to avoid overworking that night. While Exodus 12:16 allows for the preparation of food on the Sabbath, some people prepare food for the entire Sabbath ahead of time, so they can minimize their time in the kitchen or the need to purchase food. Likewise, just before sundown on Saturday, there is a short ceremony called Havdalah (meaning to differentiate or separate). It consists of overflowing wine/juice and the scent of spices, representing the overflowing joy and sweetness of the Sabbath. Jewish tradition provides many beautiful practices for the Sabbath day as well. Again, the lighting of the candles and reciting of Biblical prayers and blessings are typical. The Torah (or the whole Bible for Messianic believers) is celebrated with thanksgiving. Prayers and blessings over Jerusalem are offered. Restoration Ministries has prepared a reference guide (siddur) containing the traditional prayers and blessings from a Messianic perspective. Erev Sabbath starts on Page 11, Sabbath starts on Page 40, and Havdalah is on pages 88-89. 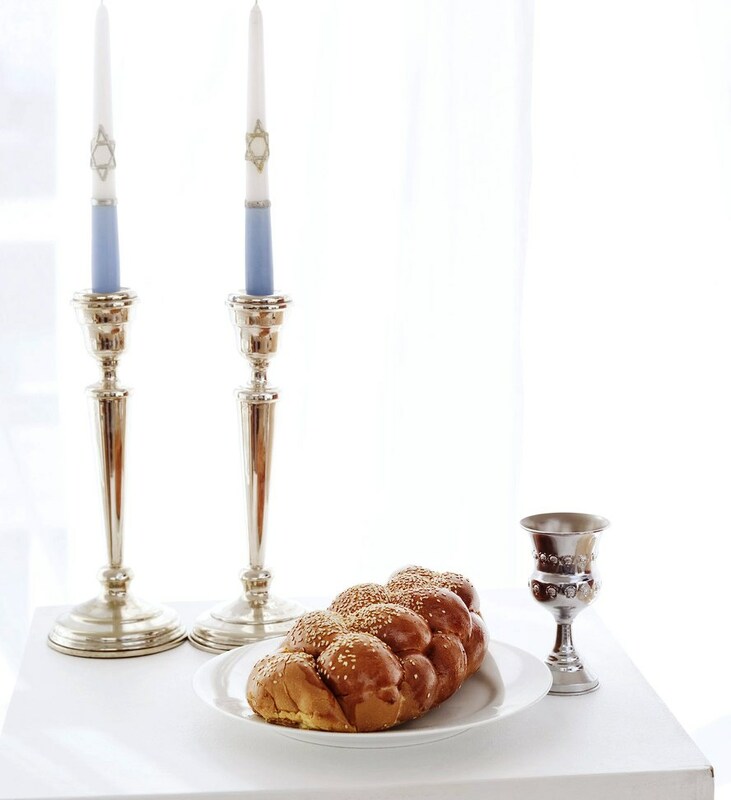 Covenant Designs offers a beautiful set of Sabbath candlesticks, a covering for the Sabbath bread, and a book specifically for celebrating the Sabbath in the home, including blessings and traditional recipes for the Sabbath. Most of Judaism and most Messianic congregations throughout the world follow a Bible reading schedule. While not one of Yehovah’s commandments, this unifying practice can be a powerful way for Yehovah to speak to his collective people each week. Based on the Hebrew language of the original Torah scrolls, the rabbis from ancient times (likely the 6th century BCE) codified the most obvious breaks in the texts from Genesis through Deuteronomy. These are called Parshiot (portions or the singular “parsha”) and flow differently than the chapter and verse notations we see now, which were not in the original texts. There are 54 parshiot from Genesis through Deuteronomy. These are paired with scripture from the prophetic and historical books of the Bible that are thematically related to each week’s Torah portion. These scriptures are called the Haftarah. Messianic believers have also added related scripture from the Apostolic writings (New Testament) for each Torah portion. There are one-year and three-year reading schedules that include portions from all three sections of the Bible to be read each week. Lion & Lamb Ministries’ schedule of readings provides all three portions (Torah, Haftarah and Apostolic) for an annual cycle. Restoration of the Torah provides insightful, Messianic commentary on each of the 54 portions. Set a date to begin, then clear your schedule for as many Friday nights and Saturdays as you can (or as much time as you can during the 24-hour period). Tell your family and/or friends you’re taking a day off and invite them to join you in doing so for whatever portion of it they can. Make a plan for your 24 hours. Decide what you’ll do with your time beforehand. If you have no plan, it’s easy to get pulled into other peoples’ plans or let other projects creep in. Anticipate what might come up to pull you away from your time with Yeshua, and do whatever you can to pre-empt it beforehand. Plan your offering and be deliberate about the giving of it (as you would to give someone a gift). Be aware that the enemy does not want you observing the Sabbath. Once you commit to doing it, don’t be surprised to find opposition, unexpected emergencies, distractions, doubt or discouraging thoughts and emotions. Avoid conflict; modify your plan to fit any physical ailments or limitations that arise, submit to Yehovah any last minute obstacles that threaten to keep you from observing it, then observe it as much as you can. Don’t let the enemy steal the gift of the Sabbath Yehovah is trying to give you. Resolve to follow only Yehovah’s leading. He will empower you to do his will over time as you commit to it. Persist in doing what you can and in expanding it over time to eventually encompass sundown to sundown. As you begin your day, don’t let the rules or do’s and don’ts discourage or dominate you. I can attest that as you are diligent in spending this day with Yeshua, you will be motivated to do whatever it takes to simplify that day and protect that time. The do’s and don’ts will become a distant memory, irrelevant to you and Yeshua’s special day. This will be the highlight of your week, your favorite day, the day you can’t wait to reach and hate to end. You will enter into new joy, rest, intimacy and perspective for the rest of your week and, indeed, your life. May the peace and joy of Yehovah be yours as you begin keeping his Sabbath. This entry was posted on October 6, 2015 by Administrator. It was filed under Sabbath, shabbat and was tagged with church, erev shabbat, havdalah, messianic congregation, messianic resources, offerings, parsha, torah. No cooking on the weekly Sabbath only on holy day Sabbath’s. That’s what that verse in exodus refers to not weekly Sabbath. Glad to hear it, Brenda. May YHVH bless your diligence with his presence in your Sabbath time. When one has lived a dysfunctional life of 62 years, yet has near 30 years of private study through never being a church member or a part of any religious organization — along with this past decade of living as an American have-not in the Philippines while creating 16 free websites, dealing with many health issues from my wife’s physical difficulties while living on faith with zero income — and seeing the true colors of today’s misled Christianity that have no love with deed for others in need —- I have been alone with no genuine brothers or sisters, lived a very difficult life, and kept the faith along with really wanting to keep the Sabbath and all appointed Feasts and Holy days — but have just never really known how to do it alone. Being the sun has set and I searched for an answer — finally after so many years I have found instruction on what to do best as possible until sunset tomorrow being Saturday night. I am very thankful for this article being from your own experience. He is coming for you. Allow his joy to pour over your sorrow. I know Sabbath observance will be a gift for you that grows over time and refreshes you every week. May Yehovah bless your pursuit of him. This post is over a year old but it blessed me. I too observe the Shabbat, feast days and other mitzvot alone. I live in rural Japan. I’d like to place a link to this article on my blog-is that alright? Yes, certainly. I hope your readers will be blessed as well. Hello my brothers and sisters in Christ. For the past 6months I have just found My Lord Jesus Christ as my One and only Savior and on Dec.11,2016 I became a born again Christian. I started doing my Sabbaths which I feel so blessed but like always the enemy comes between my Lord and myself I came across this page and I have always wanted to know how can I get my family to join me in my Sabbaths as much as I try they wount they are into there own will but I am not and when I read what you wrote it inspired me to continued my Sabbath by myself and my Lord Jesus Christ. Thank you the Lord put you in my path so I wount give up my faith and keep my holy Sabbath in honor of our King. I would like to join Sabbath keeping believers around Nairobi Kenya if there are any here. We do keep the Sabbath at home with my family and would welcome messianic believers of YWH, to meet & fellowship together in encouraging one another, reading the word,keeping the feasts of the Lord, obeying the commandments and being disciples for his service to others. May the Most High, bless and keep you all. He said that because He came to fill it full – show us the true way to live the law in addition to the written word, which had been tainted by human interpretation. The word “fulfill” would be just as when you fulfill your marriage covenant – you continue it, keep it, uphold it, not abolish it or complete it. May YHVH bless your pursuit of him. This website is an answer to my prayer and so saturated with the Presence of YHWH and His Holy Spirit! I weeped before the Lord as I read the words in the article! They echoed my heart and questions I had as well. I truly sense the pull to observe the Sabbath and feasts not truly understanding why. I just want to please my Lord! My family is not really understanding and I don’t force them to. I feel so special to be drawn closer to God. I am enjoying how the Holy Spirit is seemingly courting me. Letting me know it’s ok and that I’m hearing Him correctly. It’s seems like He speaks right on time when doubt comes. This website has such a gentleness about it and comforting spirit I know it’s Father God speaking through you. Please keep posting. This website is truly ministering life to me! Shalom and Many Blessings! Adrienne, I’m so glad YHVH is speaking to you and the Holy Spirit drawing you. You are right – it is very humbling and exciting to know that he has chosen you to share himself with in this way. I know he will continue to guide and bless you and make a way for you to obey him as you pursue his leading. Thank you for reply and encouraging words. I am truly humbled and honored. I HOPE YOU CAN SEND ME A WRITTEN DOCUMENT ON THE TEACH OF THE SABBETH MY ADDRESS IS PHILLIPE MOSS 75 WOOD CEMETERY LANE JACKSON TENNESSEE 38305. I have now added a Print Version at the bottom of the post (before the Comments). You are providing wise counsel to those seeking Yeshua. Shalom. pls help me with the dates of 2015 Jewish new moon and the dstes of the feast of trumpet, atonement, and tabernacle. thanking you for your good work to we Igbo Jews. May YHVH’s blessing and protection be over you and your congregation. Shabbat Shalom, I would like to share this article in one of my upcoming News Letters on sightedmoon.com. You have touched a subject that needs more touching done to it. Many sit at home alone wondering how to keep the Sabbath alone. Yes, Joseph, please share with anyone who could benefit from it. Ryan, I wonder why they don’t also observe the feasts of the Lord stipulated at the same time in Leviticus 23? “By the seventh day God had finished the work he had been doing; so on the seventh day he rested from all his work. Then God blessed the seventh day and made it holy, because on it he rested from all the work of creating that he had done.” Gen. 2:2-3. 513dutchie, God gave us both Saturn and the Sun, look to the source for your life. I loved your reply. I look for people who can answer with God word. What a wonderful witness. May YHVH continue to bless your faithfulness. My heart is warmed. I saw this on NC Renegade, meaning that there are others besides me who are professing talmidim of Yeshua in the NC liberty movement. Thank you! That’s fantastic, John. Shalom to you as well. Thank you. I appreciate your posts as our Lord leads me in deeper intimacy with Him through Sabbath worship. Has become a very sweet & looked forward to time for me with Jesus. I can relate, Michele. Blessings to you. As a remote medic in the North Slope Oil Fields, I’ve spent many Sabbaths by myself in Camp. I’d remember the Sabbath on the Preparation Evening and ask my Heavenly Father to help me keep His Sabbath in my remote setting. I try to remind others of Shabot as frequently as I can, and I always enjoy questions from rig hands that have know idea what Shabot really is. My best time was on my first Passover last year. I’d felt impressed to keep Passover for several months before, and I ended up in camp. Passover evening I had no idea how I was going to have the Passover meal, and I ended up getting called to another camp for a patient. While at that camp, I checked the kitchen and found Humus and Matza from Israel, and I had to stay up all night with my Patient. I was just sitting at my table starring at my Flat Bread when a truck driver, Big James, came over and asked what I had? I told him it was Matza and Humus for Passover, and asked him if he’d ever seen that in an oil field camp before in the artic? I knew without a doubt what God wanted from me after that evening, and that I wasn’t just deluding myself about what God expects in obedience. The same God that provided Manna in the desert, can provide Matza in the Arctic. Most of all, He wants to provide for us if we will just be willing to walk with Him. I did First Sheaths, Yom Truah, Yom Kippur, and was home for Sukkot(my son built a Sukka while I was gone); I’ve been learning the Feast days one at a time, and looking forward to Passover and unleavened bread this year. It all turned out good even when I was alone. Thanks for sharing that wonderful story, Michael. You’re absolutely right – YHVH empowers us to keep his commandments when we commit to doing so and ask for his help.